** NOTE: —This book is printed with an outside margin where there are many passages of Scripture that will direct the mind of the reader to those portions of the Bible which give light upon The Story of Daniel the Prophet. There is a “Margin link” with a number at the bottom of every page which goes to the margin references for that page. The prophecies of Revelation cover the period of the time from the first advent of Christ to the earth made new. The history of the Christian church is repeated four times in different figures, illustrating almost every phase of experience the church will pass through. Portions of the history are repeated several times. The book of Revelation opens the portals of the city of God, and presents to the readers, Eden restored, with its tree of life bearing twelve manner of fruit. The study of prophecy, by many, is considered uninteresting, and much that is written upon this subject is given in an argumentative style, which is unattractive to many minds. 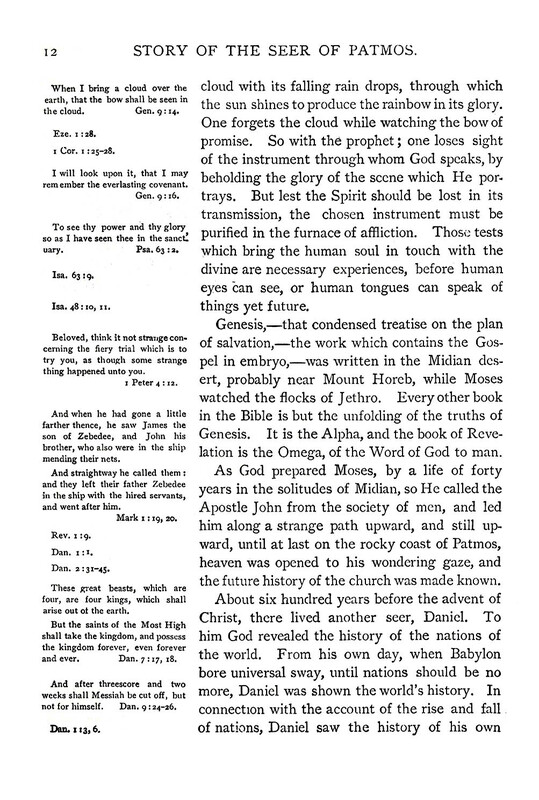 The “Story of the Seer of Patmos” is a treatise on the book of Revelation, given in a narrative style, interesting alike to old and young. The “Story of the Seer of Patmos” is sent forth on its mission of love with earnest prayer to God that it may point all who read to the Lamb of God that taketh away the sin of the world. May the Bible student find treasure, the skeptics find ground for faith, and the thoughtless become acquainted with the thoughts of God by reading this book. May the Lord bless it in its mission; and in love of the great Master, may it prove a blessing to thousands of souls who are struggling with the conflicts and ills of this life, and guide them to the pearly portals of the New Jerusalem. One of the distinguishing features of the age of the world in which we live is the prevalence of light and knowledge. It is but a fulfillment of the divine words: “But thou, O Daniel, shut up the words, and seal the book, even to the time of the end: many shall run to and fro, and knowledge shall be increased.” Dan. 12:4. During the preceding century, more than in all the centuries of the past, a flood of light has been shed upon the prophetic page. The seal which metaphorically hid the true meaning of the book of Daniel has been removed by the fulfillment of nearly all its predictions, so that the records of history demonstrate its true meaning. Prophecy is history in advance. History is prophecy fulfilled. When both agree we have the genuine meaning. Therefore we know we are in the “time of the end,” and very near its close. The book of Revelation is introduced by the following words: “The Revelation of Jesus Christ, which God gave unto Him, to show unto His servants things which must shortly come to pass; and He sent and signified it by His angel unto His servant John.” Rev. 1:1. As the book of Daniel reaches to the “time of the end,” and the book of Revelation contains “things which must shortly come to pass,” before the end, the two books must be “companion volumes,” closely related to each other. The book of Daniel, in point of time, precedes the book of Revelation upwards of six centuries. In short, the latter is largely an inspired commentary on the former, and as such, becomes a valuable aid to its correct understanding. Every earnest, intelligent student of prophecy will study these two books together. Each is mutually helpful to the understanding of the other. concealed. It is something made known. In other words, this blessed book makes known to us the things God wishes us to know. He reveals to us the nature of the events to occur all through the Christian dispensation, and especially those connected with Christ’s return to this earth at His second coming. The “Revelation” is a book of symbols. The representation of mighty kingdoms by the symbols of beasts, as given in Daniel and Revelation, is common among the nations of the earth. We speak of the British lion, the Russian bear, the American eagle; and every intelligent person understands what is meant, because nations themselves have chosen these creatures to represent them on their flags and standards. Inspiration chooses symbols to represent various nations, and the Scriptures themselves plainly define their meaning. There are no books in the Bible of greater interest to the earnest student than the visions of Daniel and John. This volume, “The Story of the Seer of Patmos,” is a companion volume to “The Story of Daniel the Prophet,” by the same author. We doubt not that this volume will equal or exceed the former in popularity. The author is a devoted minister of the gospel of long experience; a deep and most earnest student of the holy Scriptures, and especially conversant with the subject of prophecy. He has given many years of careful study to the subjects contained in this volume. It is written for all classes of readers. The most intelligent professional man can find herein blessed food for thought, and precious instruction in the Bible truths for this remarkable age. The business man can be greatly profited by the perusal of this volume. Men need to have their attention called away from worldly themes, to the great things God is about to do in our world. The common people will read this volume with delight. It will open up great fields of thought which they have never before explored, while the Bible student will find in it a rich mine of treasure. Three Messages, etc. It ends with the glorious restitution of all things, spoken of by the “mouth of all the holy prophets since the world began.” Here are themes worthy of the most careful study. The author has made these mysterious symbols so plain, that anyone who will carefully follow him can understand the book of Revelation. We are living at the close of the great prophetic periods revealed in Daniel and Revelation. We greatly need the light contained in this volume. We most gladly welcome every additional ray of light shining on our pathway. The perils of the last days are around us. Great changes are occurring. Satanic deceptions abound on every hand. The time has come, foretold by our Saviour, when if it be possible, even the elect are in danger of deception. Matt. 24:23, 26. The Revelator speaks of the same things. Let all become intelligent in reference to these things. “The Story of the Seer of Patmos” will enlighten all who will read and study it. Our Saviour informs us that when the signs of His coming begin to come to pass His people should look up and lift up their heads, for their redemption draweth nigh. Ah! dear reader, do you not desire to be a citizen of that glorious city spoken of in the last chapters of Revelation, with its gates of pearl, streets of gold, wall of jasper, and foundations garnished with precious stones; where the tree of life shall grow, and the river of life flows out from beneath the throne of God; where Christ will ever dwell? Where God shall wipe away all tears from the eyes of His people; where death will never come, sorrow will never be felt, nor pain evermore exist? Study the blessed Revelation, and you will get new and blessed conceptions of these great divine realities. Nashville, Tenn., April 24, 1905. The history of this world is fast closing. Events are taking place, in the physical, political, and spiritual world, which show that we are living in a crisis such as has never been since the creation of this world. The voice of innocent blood crieth from the ground. The nations are angry. Not one nation, but all the nations of earth, look forward with fearful apprehensions to what is coming. The prophet, in view of this time, exclaims, “Watchman, what of the night? Watchman, what of the night?” The watchman said, “The morning cometh and also the night,” —the glorious morn of salvation that will bring deliverance to the people of God, and the night of eternal death to those who reject the repeated warnings given in the Word of God. Through John on the Isle of Patmos, the Lord lifts the veil, and lets us see the history of the church in its relation to the world. Seven times the prophet exhorts all who have an ear, to hear what the Spirit saith unto the churches. We invite all to a careful perusal of the contents of this book, with the prayer that God will impress minds by His Holy Spirit. It is not the design of the writer of the “Story of the Seer of Patmos” to arouse discussion and awaken controversy upon theoretical points, but to tell the truth as it is in Jesus Christ. The book is written in a narrative style, and the symbols are explained by the marginal references, so that the reader will readily find a mine of rich treasure in the book. The entire book of Revelation is printed in italics on the margin of the pages, together with several thousand other scriptures which throw light on the subject. We earnestly pray that God’s blessing may rest upon the readers, and that the book may help many to become better acquainted with the Book of all books, the Word of the living God.